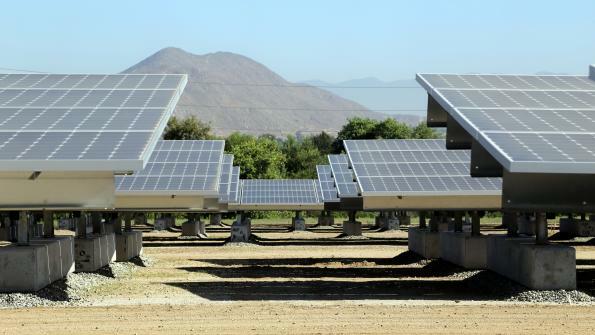 The 7.5-megawatt (MW) solar energy farm located on Riverside, Calif.’s former Tequesquite Landfill is now operational. The city’s total solar generation has soared past the 25-MW mark – five years ahead of schedule. Formed in 2005 by Bailey’s predecessor, Ronald O. Loveridge, the Clean & Green Task Force looked for ways to improve the city’s appearance while making city practices more sustainable. The task force is made up of local leaders and city personnel. Among the goals the task force recommended was to install at least 25 MW of solar energy generation within the city by 2020. The new 7.5-MW Tequesquite Landfill solar farm, created in partnership with Riverside Public Utilities (RPU) and SunPower, helped the city reach and surpass that 25-MW goal. “We’ve come a long way from our first solar generation project [a carport shade system at the Utilities Operation Center constructed in 2001] to the nearly 1,700 systems that are online in Riverside today,” the city’s Sustainability Officer Michael Bacich says. “Solar is mainstream and cost-competitive with traditional energy sources today, and can help fiscally responsible agencies reduce electricity costs to better serve their constituencies,” says Howard. Click here to learn more about SunPower.